I think it is fair to say that no French writer save Alexis de Tocqueville has been more influential in the United States than Thomas Piketty, director of studies at the elite Écoles des Hautes Études en Sciences Sociales in Paris and, most important here, author of Capital in the Twenty-First Century (Harvard University Press). Piketty's magnum opus has succeeded in achieving its goal of provoking a serious public discussion about a shadow hanging over capitalism, the rise in economic inequality. The 700-page tome soared to the top of The New York Times' bestseller list, was praised by leading lights in the economics profession, venerated by op-ed columnists and assorted talking heads, and critiqued by serious social scientists and political partisans alike. Even if Capital… holds the record for the fewest pages read by the most purchasers (beating out Stephen Hawking's A Brief History of Time), it has provided an immense service by engaging the public in the economic theory of income distribution and by stimulating a sometimes-thoughtful discussion of the future course of inequality. By this time, the book's strengths are widely known. It assembles and reviews centuries of data on capital's share of income in several countries. It gathers evidence on both the rate of return to capital and economic growth. It provides a provocative and intuitive theoretical argument predicting that income will become increasingly concentrated in the hands of capital owners and their heirs in the future if, as has been the case throughout much of history, the return on capital exceeds the growth rate of the economy. And it provides a sweeping perspective on economic history and the history of economic thought. Larry Summers, the former Treasury Secretary and president-emeritus of Harvard – and not one to suffer fools – called the book "a Nobel Prize–worthy contribution." The U.S. may be headed for an inequality trap, where rising inequality in one generation reduces opportunities for economic advancement for disadvantaged children in the next generation, and so on into the future. Scholars have also raised some serious shortcomings with the analysis. No, I don't refer to the Financial Times' Chris Giles's overwrought and insignificant allegations of data errors (What is the world coming to when journalists can levy allegations at serious research without vetting, and yet command instant global attention?). Far more important issues have been raised by Per Krusell of Stockholm University and Tony Smith of Yale, for example, as to whether it is appropriate to assume (as Piketty does in what he calls the "second fundamental rule of capitalism") that capital's share of national income will tend toward the ratio of the savings rate to the growth rate in the long run. The two economists note that the "fundamental rule" is untenable at one extreme (if growth falls to zero, savings would consume all of GDP) and that it is inconsistent with U.S. experience. They also point to alternative models of economic growth that are more consistent with U.S. experience. Serious related questions have been raised by Summers and others as to whether Piketty is sufficiently sensitive to the role of capital depreciation. Still others have pointed to the reality that inherited wealth is spread over multiple heirs, that heirs do not always invest wisely, and that many wealthy individuals choose to donate the bulk of their wealth to charitable causes rather than leave it to their offspring (thank you, Bill Gates and Warren Buffett). A man educated at the expence of much labour and time to any of those employments which require extraordinary dexterity and skill, may be compared to one of those expensive machines. The work which he learns to perform, it must be expected, over and above the usual wages of common labour, will replace to him the whole expence of his education, with at least the ordinary profits of an equally valuable capital. In modern economies, the returns to human capital account for the lion's share of national income, and investment in human capital drives economic growth. (See, for example, my May 1999 paper in the American Economic Review: Papers and Proceedings for evidence on the outsized role played by human capital in the U.S. economy, and Paul Romer's 1990 Carnegie-Rochester Conference Series paper on human capital and growth.) Indeed, the categories referred to as labor's share of income and capital's share of income appear crude and antiquated when one can compare the share of income accruing to diverse groups ranging from managers to college graduates to high school dropouts. A more troubling aspect of the Piketty phenomenon is not about what he might get wrong, but what he sweeps under the rug. While the increased concentration of income among the top 1 percent of Americans has attracted enormous attention in the wake of the American publication of Capital… and the earlier Occupy movement, the rise in income inequality among the bottom 99 percent is arguably a far more important feature of the economic landscape, and one at least as worrisome. Moreover, changes in earnings associated with different levels of education – that is, human capital – have played an outsized role in raising inequality among the bottom 99 percent of Americans. Consider the following hypothetical calculation. If the top 1 percent's share of income had remained constant at its 1979 level, and all of the increase in share that actually went to the top 1 percent were redistributed to the bottom 99 percent – a feat that might or might not have been achievable without shrinking the total size of the pie – then each family in the bottom 99 percent would have gained about $7,000 in annual income (in today's dollars). That is not an insignificant sum. But contrast it with the magnitude of the income premium associated with educational achievement: The earnings gap between the median household headed by a college graduate and the median household headed by a high school graduate rose by $20,400 between 1979 and 2013 according to my calculations based on the Bureau of Labor Statistics' Current Population Survey. This shift – which took place entirely within the bottom 99 percent – is three times as great as the shift that has taken place from the bottom 99 percent to the top 1 percent in the same time frame. The global wealth tax would not directly address rising inequality among the bottom 99 percent or do anything to provide more opportunities for those who are falling behind. What's worse, there are reasons to believe that the enormous rise in inequality that we have experienced will reduce intergenerational economic mobility and cause inequality to rise further in the future. In 2012, I popularized a relationship that I called the Great Gatsby Curve (opposite page), based on earlier research by Miles Corak, Anders Björklund, Markus Jäntti and others. 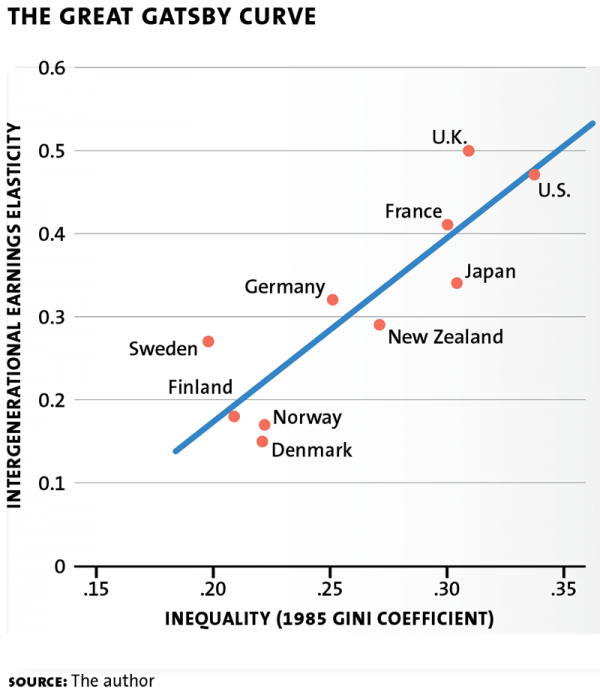 The Great Gatsby Curve shows that countries experiencing high inequality in one generation tend to have lower intergenerational mobility in the next. Raj Chetty and coauthors have shown that this relationship holds across labor markets within the United States as well and that higher inequality in the bottom half of the distribution is particularly predictive of lower intergenerational mobility. The phenomenon of the Great Gatsby Curve is predicted by standard human capital theory. If the return to education increases over time, and higher-income parents are more prone to invest in the education of their children than lower-income parents – or if talents are inherited from one generation to the next – then the gap between children of higher- and lower-income families would be expected to grow with time. Furthermore, if social networking and family connections also have an important impact on outcomes in the job market, and those connections are transmitted across generations, one would expect the Great Gatsby effect to be even stronger. There are, indeed, signs that the rise in income inequality in the United States since the late 1970s has been undermining equality of opportunity. For example, the gap in participation in extracurricular activities between children of advantaged and disadvantaged parents has grown since the 1980s, as has the gap in parental spending on educational enrichment activities. Furthermore, the gap in educational attainment between children born to high- and low-income parents has widened. The rising gap in opportunities between children of low- and high-income families does not bode well for the future. Based on the rise in inequality that the United States has seen from 1985 to 2010 and the empirical evidence of a Great Gatsby Curve relationship, I calculated that intergenerational mobility will slow by about a quarter for the next generation of children. My concern – one entirely independent of Piketty's focus – is that the United States may be headed for an inequality trap, where rising inequality in one generation reduces opportunities for economic advancement for disadvantaged children in the next generation, and so on into the future. What could prevent such an inequality trap from taking hold? The most obvious solution is to provide greater educational opportunities for children from less-privileged backgrounds. Universal preschool, for example, is a good place to start. It would also make sense to pay teachers in inner-city public schools who work with less-prepared and more-disruptive students substantially more than we pay those who work in fancy suburbs. By the same token, there's a good case to be made for funding smaller classes in poorer areas, especially in the early grades. Consider, too, making better use of the summers for disadvantaged children. Much research establishes that kids from poor families fall further behind when school is out of session. Why not lengthen the school year, as Asia and Europe have done? Or provide vouchers that low-income families can use to enroll their children in educational activities in the summer? These proposals contrast with Piketty's call for a global wealth tax to offset the forces driving rising inequality. Imposing and coordinating a wealth tax across nations is a political nonstarter. More important to my concerns, the tax would not directly address rising inequality among the bottom 99 percent or do anything to provide more opportunities for those who are falling behind. Now, before I get carried away, I should also inject a word of caution. 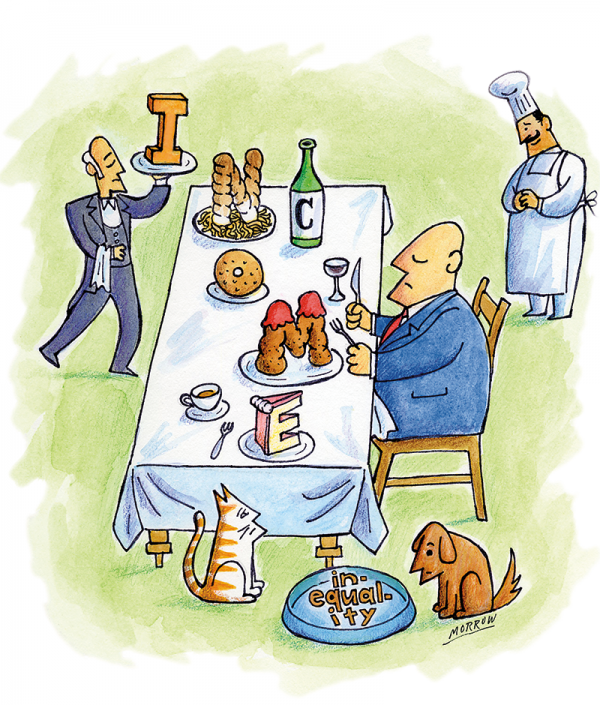 Capital… notes that deterministic predictions of rising or falling inequality – from Karl Marx to Nobel Prize–winner Simon Kuznets – have been wrong in the past. For example, the Kuznets Curve, which predicts that economic development will first increase income inequality and then decrease it, was long ago shown to be a relic of history by the careful research of Gary Fields of Cornell (which, curiously, is not cited by Piketty). As Fields wrote in 1999: "The Kuznets Curve is neither a law nor even a central tendency. The pattern is that there is no pattern." It is possible that the Great Gatsby Curve will go the way of the Kuznets Curve. Correlation, after all, is not causality. To that point, it is possible that rapid developments in online education will greatly increase access to education and improve the quality of education. 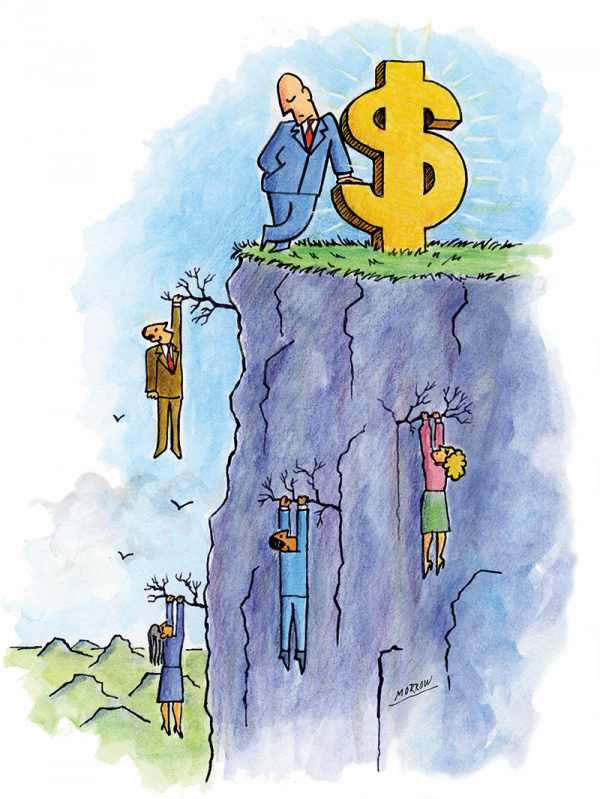 Moreover, the fact that inequality has increased at dramatically different rates in advanced countries over the past three decades suggests that country-specific institutions and policies have considerable ability to blunt or even prevent income inequality from rising. In this regard, one area where much evidence suggests that public policy can narrow the gap is worker bargaining power, such as by raising the minimum wage and tying it to the cost of living or by improving labor's leverage in collective bargaining. But even if the Great Gatsby Curve does not hold over time, a large body of evidence suggests that the societal benefits of investing more in the education of children from disadvantaged backgrounds exceeds the costs. A global wealth tax, by contrast, is an untested idea without a chance of being adopted – and, if it were, would not adequately address the intergenerational mobility issue. Piketty's Capital… may vanish from the public's consciousness as abruptly as it arrived. But generations of economists will continue to monitor income distribution for signs of whether his prediction of rising inequality, based on a seductively simple model of why income distribution changes, comes to pass. Piketty's forecast could well prove accurate for the wrong reasons, however – and, as a result, distract us from the core problem. A vast body of research aimed at explaining rising inequality among the bottom 99 percent implicates the critical role of human capital – not to mention the significance of institutional changes including the fall in the real value of the minimum wage and the decline in union membership. If we lack the determination to address it in the context of the Great Gatsby Curve, the American Dream may turn into a distant memory.